This is definitely an event that is needed in the black community! I’m so grateful that my dear friend is making these powerful moves towards positive change! Casey Elisha Books presents The Children’s Empowerment & Literary Festival which concludes The Children’s Empowerment & Literary Week, a week where we focus on celebrating literary content, products and services that relate to children and empowerment via our social media platforms. 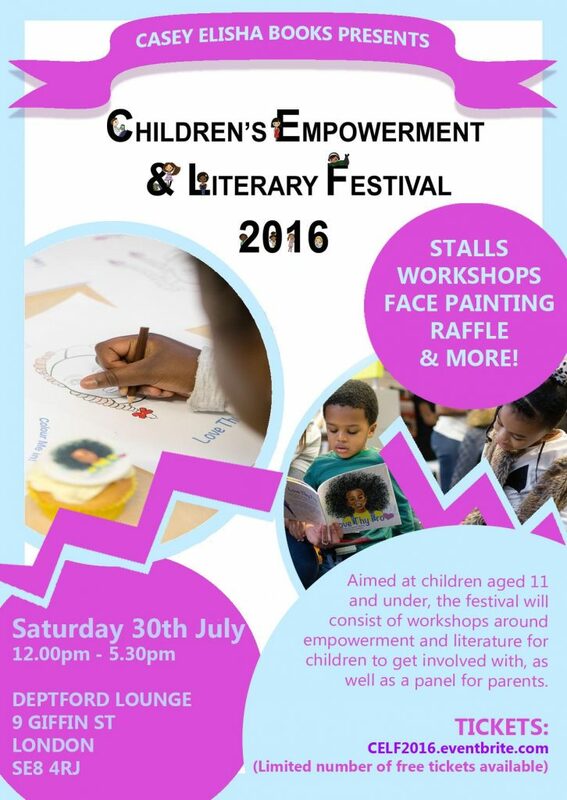 Taking place on Saturday 30th July, the Children’s Empowerment & Literary Festival is aimed at children aged 11 and under, and their parents, and will consist of free workshops around empowerment and literature for children to get involved with. I will have the pleasure of hosting a panel for parents on the day. Panelists include motivational speaker, Samuel Speaks, founder of Dare to Dream, Karen Allen, and authors Nicola Tenyue and Sade Fadipe. Nicola, author of the Chantelle Book Series, will also be doing a book reading on the day. Other workshops include a BEATiful Barbie Makeover with Hair the Beat, a Path to Self Love workshop led by Abena Hagan of Curls Au Naturel, and the I Can Project workshop led byDwayne Patrick! There will be stalls on the day selling diverse children’s books, as well as other products, from Casey Elisha Books, Curls Au Naturel, Sankofa Creative Co and more! This event is sponsored by Lewisham Homes and Cantu Beauty.